SP’s range of load or shear pins is designed for use where an end of line load cell cannot be used or when an integrated solution is required in applications such as pulley or sheave axles, moorings, winches, or support blocks. In this instance, Adaptable (or Craneva, as it is known after the website name) uses the pin on a Mecanil grapple saw. Readings are taken wirelessly on a Hand Held plus, also an SP product. Connally explained that both the load cell and pin will continue to have a purpose. The former is utilized beneath the hook of the company’s Palfinger knuckle-boom crane, while the pin provides valuable data during sawing applications. In addition to the inherent safety advantages of recording data, the pin also assists in preventing unnecessary wear and tear to equipment. As can be the case in niche applications, Craneva’s successful utilization of the load pin wasn’t instantaneous. 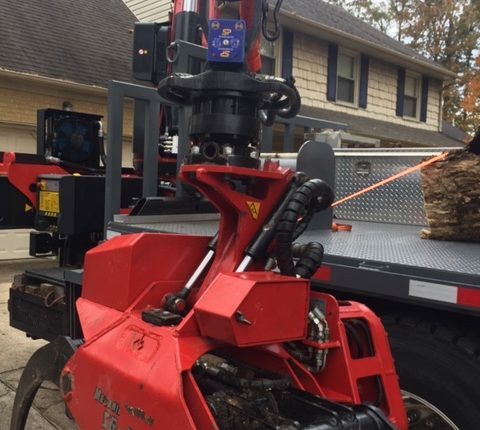 For example, remote control transmissions from the crane and grapple saw interrupted Bluetooth connection—only while running the grapple saw. SP converted the unit to use the wireless handheld receiver instead. Connally is a National Commission for the Certification of Crane Operators (NCCCO) certified crane operator and has been using cranes in arboreal applications for 20 years. Additionally, he and the team are fully trained in arborist rigging and technical rescue rigging operations. Connally is also an instructor at the Crane Safety Climber School, a class for arborists working with cranes for tree work.